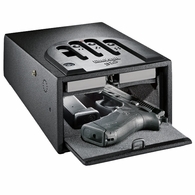 "Biometric fingerprint gun safes have come a long way. It doesn't get much easier than sticking your finger on top of a biometric scanner or resting your handprint on a reader and presto - your safe opens. 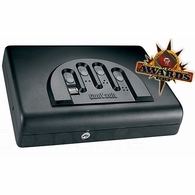 Everyone has unique fingerprints or thumbprints, so accuracy is assured." 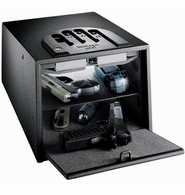 The engineering behind biometric gun safes is complicated, but the result for the user is simplicity itself. The fingerprint sensor maps your specific finger or thumbprint using capacitance and a proprietary computer algorithm. 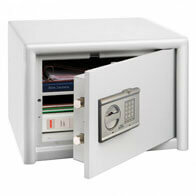 If the sampled fingerprint matches with the print stored in the database, the locking mechanism will release. 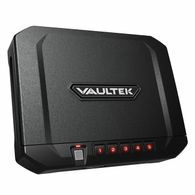 But all you really need to know is that the biometric technology can tell your print from anyone else's, so only your print will open your safe. 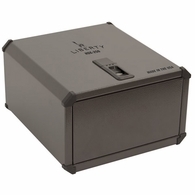 (When the print doesn't match — ie, an unauthorized user is attempting to access your safe — the lock records a missed combination and counts against the number of permitted tries to get into the safe before the lock enters a lock-out mode for a set period of time.) 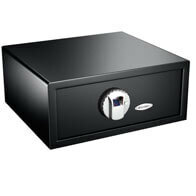 The biometric lock is available on different kinds of safes. 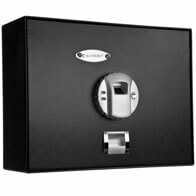 Gun Vault's line offers the GVB-1000 and GVB-2000 pistol safes and each will store 30 prints. There is a fingerprint reader inside the first position where your index finger would go. 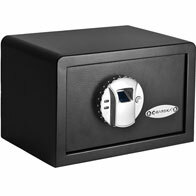 Simply place your finger on the sensor, tap a button and the safe pops open. 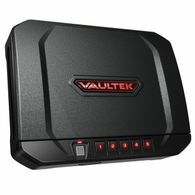 GunVault's MVB-500 will also read finger or thumbprints, but by using a scanner instead of a reader. 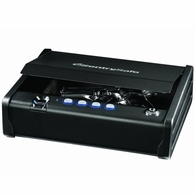 To open this fingerprint gun safe, simply press the index finger button and then slide your fingertip over the little scanner located below the button. 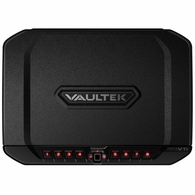 In less than a second, the GunVault has analyzed your print and opened the door. 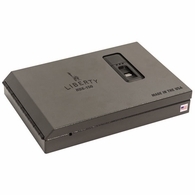 Amazingly, this fingerprint gun case can store 120 different fingerprint or thumbprints. 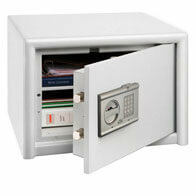 We always recommend that each user you grant access to store at least two prints from each hand. This way, should you cut your finger on one hand you can still open the unit by using a print from your other hand. 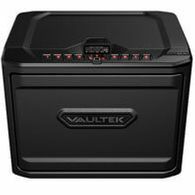 Gun Vault's new addition to their line is the Speed Vault SVB-500. 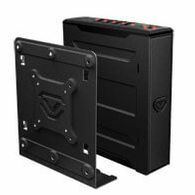 This versatile unit comes with a bracket that fastens to a wall or piece of furniture, and then the box mounts to the bracket. 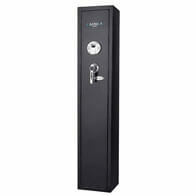 When you enter you fingerprint, the door drops down presenting your handgun for quick retrieval. Perfect for next to the bed, or even on the inside of your closet. 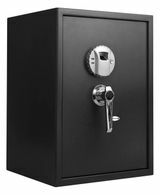 And if you're just looking to upgrade a current safe to open with a touch, biometric locks are available for many home and gun safes. 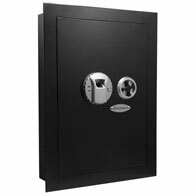 Sargent & Greenleaf biometric locks can be retrofitted onto most existing safes, or a new safe can be ordered with the biometric lock. 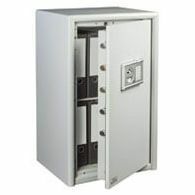 The Sargent & Greenleaf bio will store six fingerprints, and allows for the use of either the fingerprint or PIN number (as in an electronic pushbutton lock) or both. 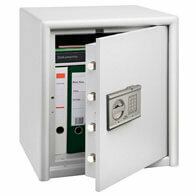 For ultimate security, you can program the lock to require both a fingerprint and a PIN number to open the safe. 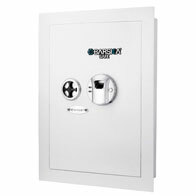 In short, pistol boxes or gun and home safes with biometric locks give you quick and easy access for your weapons and all your other valuables.